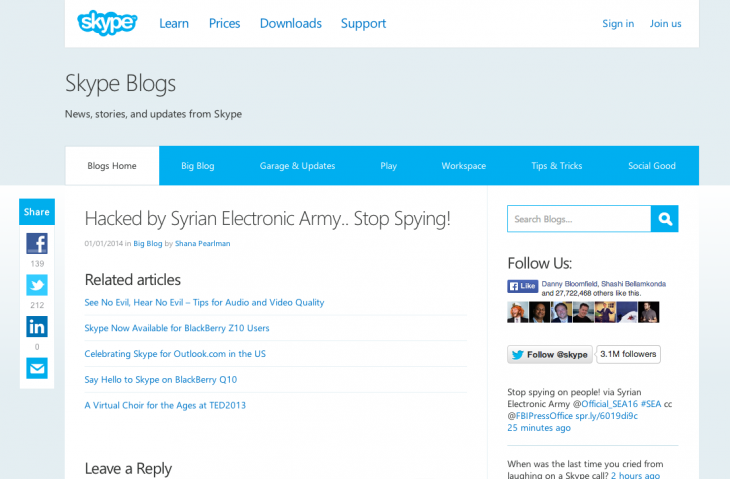 The Syrian Electronic Army (SEA) has voiced some loud opinions on the social media platforms of its latest victim, Skype. The hacker collective wormed its way in to the VoIP service’s Twitter, Facebook and blog, and the content of the posts seem to be directed at Skype’s parent company, Microsoft, as repeated calls to “stop surveillance” were made. The anti-Microsoft message was retweeted more than 8,000 times and is still available, although Skype has already regained control of its accounts and deleted messages from Facebook and the blog. While the tactics are nothing new for the SEA, which went after The Washington Post, Twitter and The New York Times in recent attacks, but the content of the message seems intriguing. There’s no doubt that the SEA’s message refers to documents leaked by Edward Snowden that detail the NSA’s access while monitoring online activities of many programs — including ones by Microsoft. At this point, the damage has been remedied, but the SEA’s objections are certain to be heard on other platforms soon. Comment to GigaOM….Fix the TITLE of your article…Skype itself was NOT hacked just Twitter and social media accounts. Indeed! I find it funny that the other few comments have clearly commented based on the title alone. In amidst all the hacking that has taken place in the last 18 months, Microsoft appears to be the only company that HASN’T lost millions of users’ personal information. I am a big user of skype and its technology. I believe Skype engineering is good enough to ensure defects like these do not creep out. However it also qualifies as an absolute use case to have even the best of the breed applications to be tested well and tested continuously and in rigour by specialistsAbsolutely makes sense to re-look at the usage of skype as an enterprise grade application.